Armored Sealcoating’s applicator team is familiar with all of our product specifications and are careful to comply with the MSDS (Material Safety Data Sheet) regulations. We always dress safely and professionally. We take pride in our safety and don’t allow anything but success and quality in everything we do from planning to materials to labor and everything in between. During the planning process, Armored Sealcoating will be sure to communicate with you and visit the site. We will identify any environmentally sensitive areas or natural resources that may need extra care or protection. We are also very conscious of the weather forecast. We know that if it rains shortly after application, we are at risk of wash off. We NEVER dispose of loose or leftover emulsion down a drain, storm sewer or body of water. We are very careful of our clean up and disposal process. Armored Sealcoating will be sure to provide clear and detailed instructions for you during and after your asphalt seal coating project completion. We will make sure you are fully aware of how long to wait before allowing vehicles onto the fresh sealcoat surface. We will clean up completely after the job is complete. And we will make sure to answer any and all of your questions. Armored Sealcoating takes pride in good practices. We hold ourselves to high standards, and expect you to too. Contact Armored Sealcoating for your asphalt sealcoating estimate in Kenosha and surrounding areas today. 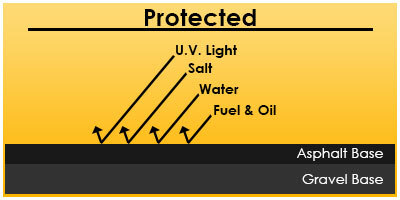 Commercial Seal Coating Kenosha Schedule Your Spring Asphalt Seal Coating Now!